Diamonds are formed when coal undergoes immense pressure for thousands of years. During this formation some infinitesimal impurities or imperfections like minerals granules, un-crystallized carbon, and tiny cracks that are formed deep within the diamondstill remain, even after going through the cutting and polishing process. These imperfections are known as diamond inclusions or exclusions. 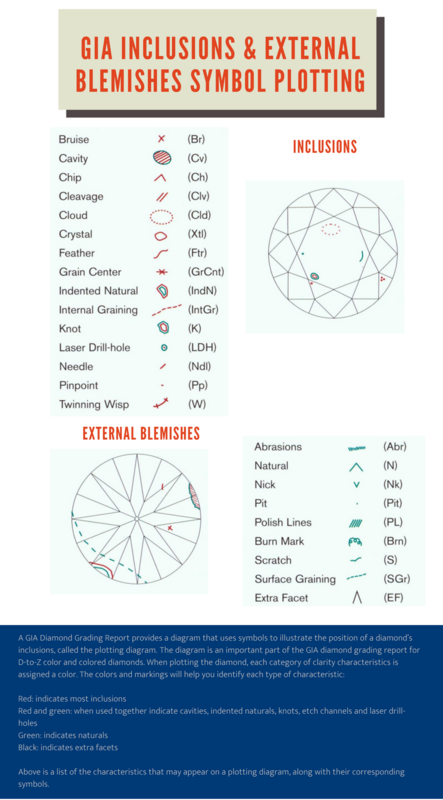 These imperfections are what makes every diamond unique; distinctive birthmarks, which are either internal (inclusions) or external (blemishes).Every diamond has these birthmarks, however no two diamonds will have the same amount, size, or type of inclusions, even if they have the same clarity grade assigned by GIA. Inclusions have direct implications on a diamond’s sparkle. These inclusion and exclusion can hinder the sparkle by obstructing light from refracting.Diamond’s clarity is ascertained by the nature, number, position, dimension, and colour of its inner attributes and set in a range. This range is known as the diamond clarity scale. It is a globally accepted industry-wide standard set by GIA for diamond grading and comparison. This diamond clarity rating is the one of the most accurate and consistent rating. Diamond’s clarity ranges from FL i.e. flawless to I3 i.e. the level of inclusions. However it is to be noted that these inclusions are not so apparent and unless viewed under a 10x magnification, it is extremely hard to notice.However diamonds with lowest grade on the clarity scale have more apparent inclusions that can be view even with naked eye. Flawless diamonds are perfect with no inclusions or blemishes on its surface even when viewed with 10x magnification. These diamonds are extremely rare and stand amongst less than 0.1% of all the gemstones. Goes without saying that have the highest value. Internally Flawless diamond has no inclusions but may have microscopic blemishes on the surface that are unnoticeable to the naked eye and can only be detected under magnification by professional gemmologist. These minute surface flaws do not in any way impact the sparkle of the diamonds and can be slightly corrected with polish. This diamond has infinitesimal inclusions that are so small that it often goesuntraced by well-trained eyes, even under 10x magnification. VVS1 grade diamonds look flawless as there is no obstruction in the light’s performance and hence look equally beautiful. Diamonds with VVS1 grade offer a great value as compared to FL and IF as the sparkle remains unaffected. Typically, VVS1 inclusions are only visible from the pavilion when viewed under magnification. This clarity grade diamond has minor inclusions that are a bit larger than VVS and can be detected though only under magnification. Though the inclusions are a bit more apparent, the brilliance is not compromised in anyway making VS a popular clarity range. The most important factor taken into consideration to measure VS1 grade is the size of the inclusions as they are slightly bigger than VVS grade. The most common VS1 inclusions include cloud, feather, needle, crystal, indented natural. VS2 diamond a slight more prominent inclusion as compared to VS1 but these too can only be detected under magnification. Even with these minor inclusion the sparkle and brilliance remains intact making VS grade diamond the most budget friendly. With a VS grade, one can optimise the other C like Cut, Color and Carat to give you the best diamond at optimum value. VS2 inclusions include crystal, feather, indented natural, cloud and twinning wisp. SI1 is characterised by high brilliance even with more inclusions. Here the inclusions are apparent to trained eyes without magnification, however cannot be detected by unskilled eyes. While buying, be cautious of crystals or clouds inclusion as they tend to make the diamond look lacklustre. Make sure that the inclusions are off centre, more towards the edges and girdle so that you get maximum sparkle at great price. Though SI2 diamond have a brilliant sparkle and fire the inclusions are big enough to be seen with naked eyes. It is more apparent to a skilled grader. Even with larger inclusions, SI clarity grade still offers a good value. It is best to consult a gemmologist before buying SI2 with single larger inclusion, cloud or central crystal as they are more visible and dwindle the sparkle. SI2 inclusions are larger crystals, twinning wisps, feathers, clouds and knots. - Avoid single larger inclusions that tend to look black and are more visible to the eyes. - Choose inclusions that nearer to the edges so they can be hidden by close settings like bezel and channel. - Avoid cloud and crystal inclusion near the centre as it tends to dull the sparkle. Because the scale of clarity is smaller, it is obvious that prices shoot up exponentially with every rise in the grade. FL and IF category of diamonds are rarest of all and hence has the highest premium. The price difference between VVS, VS and SI can range from 15% to 25% with every scale. As said before every diamond is unique, and hence the clarity of no two diamonds is same. Clarity is set by a subjective range and differs not only because of type of inclusion but also because of the location, size and number. For example: a SI1 diamondwith inclusion towards the girdle is priced much higher as the flaw can be hidden easily with the setting. As compared to SI1 with an inclusion towards the centre as it makes the flaw more apparent and hinders the sparkle making is significantly less expensive. One of the most important thing one needs to keep in mind while selecting a diamond is that all four C’s must be taken in conjunction. When evaluating the 4C's, clarity is the last characteristic to be seen as these minor inclusion and blemishes can be easily masked. However it is advisable to stay away from the extreme combination. For example, more than 1.05 carat diamond with a D grade and I1 clarity would make the inclusion more pronounced and hence not advisable. Striking a balance is necessary. Most popular and budget friendly clarity grades range from VS2 to SI2, because they offer the best blend of brilliance and price. Location of inclusions matter. Choose a diamond with inclusion towards the edged and off centre as these can be easily masked with the right metal setting. Avoid diamonds with one single large inclusion as they are prominently visible and disrupt the sparkle. Lower carat diamonds often have minute inclusions that are very difficult to detect. But if you are going for higher carat and lower clarity, maximize the cut grade so that the high brilliance tend to hide the inclusions. While selecting clarity, consider the shape of the diamonds. Diamond shapes with brilliant cuts like round, princess, cushion, pear and marquise are best at hide the inclusions, while step cuts tend to show off inclusions. It is always best to consult a gemmologist to determine which diamond is better especially if you are choosing anything below SI2. While the diamond certificate by GIA gives you a good idea of the inclusions, it is always best to get an expert opinion. A diamond’s clarity is always graded at 10x magnification as per the specifications by GIA. With diamonds of less than 1.00ct GIA gives a dossier that tell about the inclusions. Those with 1.00ct and above has inclusions specified in the GIA certificate. 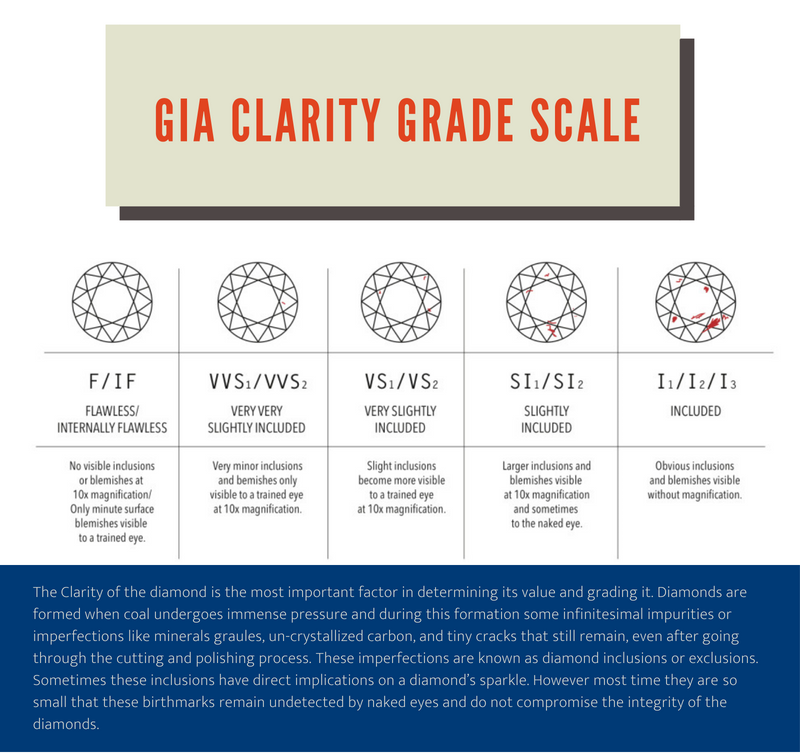 Diamond’s clarity grading is subjective process that takes into consideration the type, size location and the amount of inclusions. Each diamond is taken on a case to case bases and graded as above from FL to I3. Once the inclusions on the diamond have been noted and mapped out, a diamond plot is used to record the location and size of these inclusions. The diamond plot is a draft of the diamond face-upwith inclusions shown as different symbol. It is shown on the GIA certificate or the dossier of the diamond. Inclusions are shown with colour red, while surface blemishes are shown with green.GIA also includes comments about the diamond’s certain inclusion that aren’t invisible in the dossier and the certificate. However the certificate doesn’t tell you everything about the overall quality of the diamond as there are many factors to it. So it is advisable to consult a gemmologist along with ascertaining the certificate. Feather:Most commonly found inclusion in the diamond, a feather is a miniscule crack that forms on the surface and extends below in soft, minute tendrils like that of a feather. Feathers can look transparent and almost be invisible. But it’s best to avoid large feathers. Crystal:They are formed during diamond formation process within a diamond and even be of different colours.